A miter box is a wonderfully simple, affordable tool that allows any DIYer to make accurate crosscuts in wood. Since these tools are hand-powered, they are quiet, and they are light enough to be easily moved to any project location. Added benefit: miter boxes minimize and contain sawdust, making the tool a viable sawing solution for those working in relatively small, indoor spaces like an apartment. What Is a Miter Box? 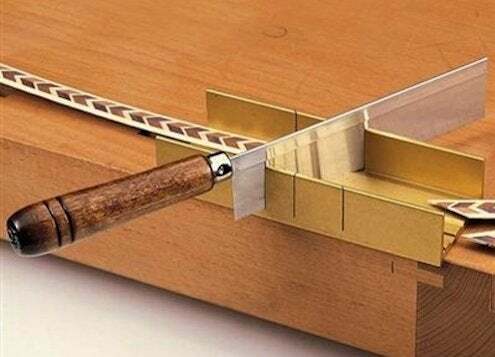 A miter box consists of two components—a hand saw whose teeth are set for crosscutting (cutting against the grain of the wood) and a “box” that is pre-fashioned with slots on both sides to help the woodworker make accurate angled cuts (typically 90° and 45°). A miter joint, the tool’s namesake, is made by fitting together two 45° cuts to form a right-angled corner. A miter box is a go-to for anyone less inclined to work with power tools, whether on account of space restrictions, safety concerns, or cost. You can buy a miter box for a fraction of what it costs to purchase its powered big brother, the benchtop compound miter saw. And comparatively, the miter box is much easier and safer to operate. Historically, a carpenter or woodworker would create his own wood miter box to use in combination with his favorite saw. Today, miter boxes can be purchased in three basic designs. 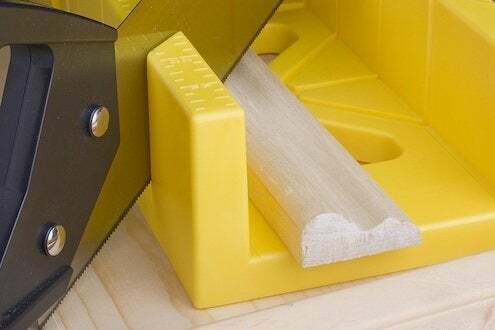 • Molded plastic miter saws are readily available from brick-and-mortar hardware stores and home centers, as well as from their online storefronts. Basic models can be had for as little as $12, while more advanced options max out around $25. You can usually pick up the classic Stanley model, pictured above, for under $15 (view on Amazon). User-friendly and affordable, entry-level miter boxes like these can make quick work of simple, light-duty tasks, such as creating basic picture frames. • The next level up are precision miter saws, which feature a higher-quality saw, a fuller spectrum of degree cutting (with stops for common angles), and hold-down clamps to keep the work piece in place. Rather than plastic, precision miter saws are made from machined metal for added strength and stability. This is the best option if you’re planning to install molding or trim, or if you cut the occasional length of dimensional lumber. 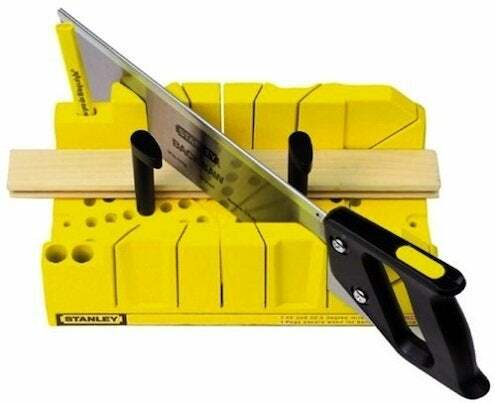 For models like the contractor-grade Stanley, expect to pay around $30 or $50 (view on Amazon). 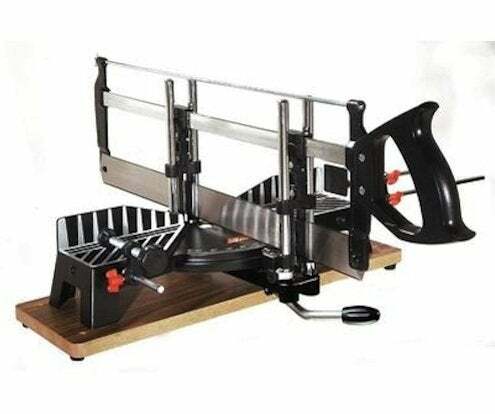 • A great hobby shop addition, fine woodworking miter saws are used for wood stock that would be damaged by the rotating blade of a power tool, or by any saw with coarser teeth. Due to its limited size, this type of miter box works best with light and small trim or decorative pieces. The Rockler Mini Combo Miter Saw Set stands out as popular favorite (view on Rockler.com). Begin by clamping your miter box to a stable surface with a bar or quick-release clamp. Alternatively, secure the box via nut and bolt. Measure your cut length accurately and use a carpenter’s square or triangle to mark the cut on your wood stock, being sure to measure to the long end of any 45° miters. Place your wood or trim in the miter box, using any clamps or hold-downs to secure the piece to the box. Make sure to correctly orient the wood toward the angle of cut, noting whether you want the cut across the face of the wood (a bevel) or across the height of the wood (a miter). Using light passes, score your cut line just to the outside of your pencil mark, then increase your effort to cut through the work piece.